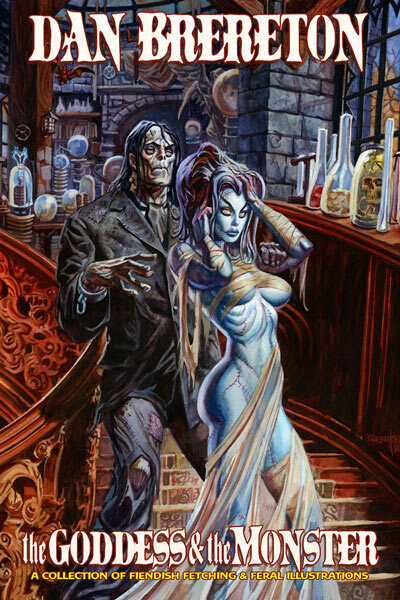 After more than 20 years, DAN BRERETON, award-winning comics creator and painter, collects his best works for the very first time in this beautiful full-color hardcover volume. THE GODDESS & THE MONSTER features 144 pages of furiously colorful illustrations in BRERETON’s unmistakable style, spanning his work in comics, film and more, ranging from the commercial to personal, adventurous to lurid, dark to heroic. Brereton has a unique style that he’s developed over the years, instantly recognizable in its crafting of faces. The book is 150 pages dedicated to his art: the only text is a short forward by the artist, a short afterward by his mother and snippets of praise from a large group of people. When I saw this book solicited I knew it would be good but I wanted to give it a thumbing before committing. While art books of comic artists have been getting wordier the last few years this volume goes in the extreme opposite: the only thing we learn about Brereton is that he has always loved to draw monsters. Hmm: I believe that become self-evident after your first pass through. The collection of material here runs the length of Brereton’s career from the late 1980s forward. Everything is painted and most of the work is wonderful. I had no idea he could draw so naturalist but there are a few pieces in the book that don’t look like Brereton at all. We’re treated to more than just monsters: chapters dedicated to super heroes, nudes, even movie characters. It’s a real feast for Brereton fans or those curious to see more of his work. The fit and finish of the hardcover is mostly good. Excellent cover production with no dust jacket. The paper used is a bit thin and I found dents and imperfections throughout the book. It’s glossy and wonderfully shows off the colours but this kind of slick paper is just too thin: I recently experienced the same thing with [intlink id=”1724″ type=”post”]The Marvel Art Of Joe Quesada[/intlink].